Many things comfort, especially in the kitchen: the embrace of a roast; the blanket hug of bread baked and calmly steaming on the side; the soothing seethe of the pressure cooker, to the little tug chug of the dishwasher and the smell of newly clean linen on the dryer. Even better if it's raining outside. The kitchen is the snug hub of our home. And that's where we make our gravy. I was chatting through a roasting recipe with a friend who was also after some gravy tips when I realised I'd never blogged it; never even taken a photograph it seems. This is a curious omission. My family will tell you that I often call them in for a taste, or just a look, with me stood proudly, like a child, with a roasting tin or saucepan of some glossy, well reduced wonder. 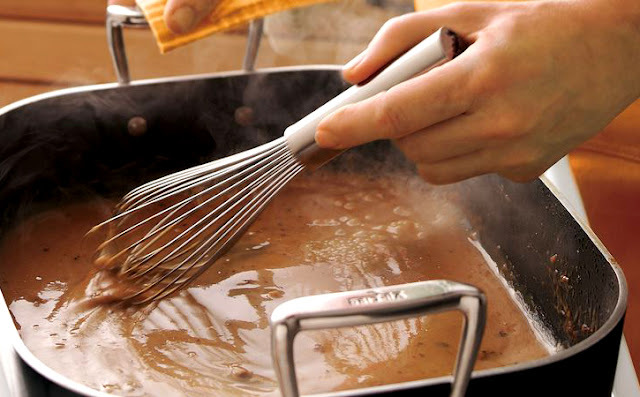 A good gravy is a triumph and can elevate a meal from mediocre to memorable. But it should enhance the food not dominate. A fillet steak with a rich gravy will taste of... gravy. It should be both the bass notes, underpinning the music, and the piccolo, adding interest and contrast. I know, I'll stop with the metaphors. All this pretension for what is essentially boiled bones and flour. First. Let's shoot the elephant in the room - those big bones will make excellent stock, after all. I know some of you might use, might even think you enjoy... gravy powder (I can barely bring myself to write it.) If you do, I don't really want to know. I'll just get upset and it will forever blight our relationship; like walking with something grim and sticky underfoot while we chat. I've written about why fake gravy is a heinous crime. It's there if you want it. And hey, it's Christmas, let's make an effort. Much of my progress over these past few years has been into food simplicity. Increasingly I think that most things are better left alone. I am not an Ottolenghi (is it true there are 23 ingredients in his glass of water recipe?). Meat especially is often best served as a simple roast, same with vegetables. If you want complexity of flavour, do it by mixing elements This gives control to the eater. Gravy is the big exception. Gravies are complex; they take time and effort - often more than the rest of the meal elements combined. The simplest of gravies is roasting juices and pan scrapings, maybe deglazed with some alcohol. This works well with fatty, juicy meat, less so with the leaner, more expensive cuts. You won't get more than a few spoonfuls from a fillet of beef or a rack of lamb. Sometimes, often, you want a thicker sauce too, something to coat your roasties or Yorkshires with. This is how I do it. You need a big pot: a stock pot. This will take a while so we might as well go large. First let me tell you a secret: shop stocks are awful... and expensive. I have no idea why they are all so uniformly awful but they are. Doesn't matter that they have a grinning Blumenthal on the packaging. Don't bother. Make your own. A home made stock will also contain gelatine for a much better texture. Make a lot and then bag it up for the freezer. Mine is a mass of beige and amber ice. I use a roll of plastic bags from Nisbets, about a litre at a time. You could go smaller, as I tend to serve large groups. Do remember to label them though. Lamb stock tastes very different to chicken. I'm going to divide gravy into five elements. Stocks are made by slowly simmering meat bones and trimmings, along with aromatic herbs and vegetables, in lots of water. If you have a pressure cooker, so much the better. The higher temperatures mean more flavour making Maillard reactions in the pot. Supermarkets are next to useless when making stock. They won't (can't) sell you the offcuts that make for bad eating but great gravies. You need to go and talk to a butcher. If you're local to Enfield try mine: F. Norman's in Oakwood. Tell them I sent you. Generally I make stock by simmering (or pressure cooking) meat and aromatics in water, covered, for a couple of hours then allowed to cool. I sieve the liquid off into jugs, sealed with cling film, and leave overnight in the fridge. This means any fat present will collect in a layer at the top making it easy to skim off (and use if need be). The skimmed stock can then be fast boiled to reduce and concentrate flavours. Don't boil an unskimmed stock; you will end up with something cloudy and greasy. You can take this concentrating stage to a higher level by clarifying the stock. I use a few egg whites and crushed shells whisked in. The stock should be brought to a simmer as slowly as possible and simmered for at least thirty minutes. The egg white captures all the unfiltered particles as it solidifies and, once sieved (ideally through muslin or a new kitchen cloth), you should have a fabulous, clear consommé. You can always double stock, stock. That is: reboil with extra meats and aromatics. I often do this for improved flavour, or if the stock is lacking an element. Never add salt at the stock stage, only ever in the final gravy. For beef use chunks of marrow bone, any trimmings and maybe a kilo of chopped oxtail. You're looking to fill an oven tray. The weight will vary. Make sure your butcher gives you manageable chunks. The more surface area, the better. Roast the bones and trimmings for about an hour at 220°C until brown and chewy. Being sure to scrape all the sticky bits off the bottom of your tin, place the roast in about five litres of cold water. Roast two kilos of scrag end, along with any trimmings from your joint, for about an hour at 180°C. You can give your partner the bones to nibble on afterwards. You can in my house anyway. She wasn't fed properly as a child or something. Carcasses are an obvious choice to roast and boil... but who has several at once, unless you've recently feasted on fowl? Short of carcasses, try a couple of kilos of chicken wings. If you've been nice to your butcher, they may well bung them in for free. Turkeys often come with the neck and other giblets in a bag. All good. Dice them up to make the flavour release easier. Again, brown your chicken bits in the oven for an hour. Unless you want a pale stock, in which case, don't. You used to be able to buy tough old birds called 'boiling fowl' and these are excellent for a pale but deeply flavoured broth. Ask your butcher. Again you can use the meat afterwards, but it won't taste of a great deal. Ah, yes, pork. For some reason, pork stock almost never features in (European) recipes. Maybe it's because it's not part of the classical French canon. But why isn't it part of the...? I don't know. I use pork stock for pea and ham soup and for pork and apple gravy. Be careful when making pork stock. Many pork products contain prohibitive amounts of salt that would result in an unusable broth. I'd go for either trotters (yes, I can hear the squeamish screaming) or (more likely) a couple of cheap pig knuckles - just make sure they're unsmoked. You can even use the knuckle meat to make a terrine or soup afterwards. Once your meat is ready and in the water, you need the aromatics: vegetables, spices and herbs. These elevate an otherwise flat base, adding nuance and highlights. Most stocks will welcome the holy trinity: onion, carrot and celery. Perhaps two of onion, three of carrot and celery (stalks). Coarsely chopped and sweated slowly in butter to render sweet and remove any harsh notes of allium. Do this with some woody herbs: thyme, bay leaves, rosemary. Fennel is great for pork and lamb stock but can be potent. Bash up half a bulb. For dark stocks roast off a couple of chopped onions or shallots for forty five minutes at 160°C. You're looking for a golden brown not burnt. If in doubt, taste the darkest part. Do not use anything black and bitter. The smallest part can taint a stock. There is a subtly here though, and I'm reminded of the Father Ted gag about priests' socks. Some things are not black but very, very, very dark brown. Let your tongue tell you. Mushrooms are excellent roasted or dry pan fried, especially with beef. Shiitake and ceps are hugely rich in those desirable, meaty, umami tones, if a rather expensive addition. Basic shaggy mushrooms, trimmed, washed and fine sliced will also do. Let them catch and brown a little. Peppercorns. I usually throw in a handful with any red meat stock. The whole berry (peppercorns are dried berries) adds a more subtle touch than the freshly ground. More of a happy hum than a bright tune. Leafy herbs like basil, parsley, oregano, coriander should probably be left until the final gravy. Their flavours are ephemeral. A bunch of parsley stalks can add a pleasing vegetativeness though. Alcohol, in the form of grape based fermentations, brings acidity, sweetness and a fruity base. Many recipes tell you to put alcohol directly into stocks but I don't usually, preferring to greatly reduce it on its own, almost to a syrup, to be added to the gravy later. Easier to add in increments, especially when you don't know how flavoursome your stock will be. All wines and spirits should be reduced by boiling. This rids it of much of the eyebrow raising harshness and stops one getting drunk on the gravy. Plenty of time for that later. Don't use anything you wouldn't drink and don't assume one wine will taste like the next. Sweetness makes the difference here, those subtle tannins and fruits tend to cook out to no difference. Serious Eats did a proper study of this. Red wine is the most obvious participant. I keep half and quarter bottles next to the hob for when I need a quick splash. White wine works just as well though remember and can be better when you're looking for a fruity or mineral note. All the fortified wines work well; I am guilty of pouring port into almost everything. It's great with beef and lamb. Madeira or Marsala with pork, or perhaps Calvados or another apple brandy. With chicken I tend to reach for the vermouth; its herbaceous-ness works well with poultry. Ideally a gravy should be reduced until it reaches the desired consistency but this isn't always possible. You simply might not have enough liquid to do that for a start but also, if you have a deeply flavoured stock you might not want to further concentrate it. I tend to make a beurre manis, a mix of equal amounts of melted butter and flour. You only need about 15g of both. This can be cooked on the hob slightly to remove any floury flavour before whisking into the gravy. 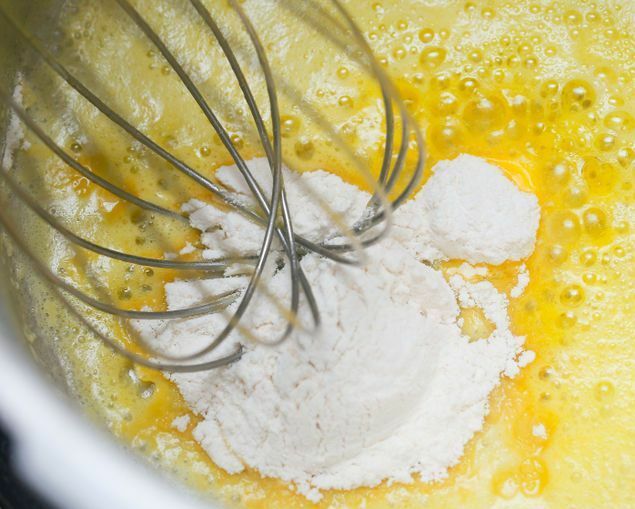 All flour thickened sauces should be gently boiled to remove the starchy flavour and to start the thickening process. Corn starch mixed with a little cold water and whisked in also works well. Not much is needed. A tablespoon of cornstarch will easily thicken a litre of stock. Remember to simmer the sauce for a few minutes though. Butter, chilled from the fridge and cut into small chunks can be whisked into a warm sauce, adding richness and shine. Don't then boil the sauce though as the butter may split out leaving you with a greasy nonsense. So you have your meaty, glossy, aromatic gravy. You are about to pour it over your perfect roast but then you remember that thing you should do, that beat before the birth of any table wonder. YOU TASTE IT. Funny how many cooks send things untasted out of the kitchen. You TASTE IT and you look skywards. 'Something' is missing. This is the job of the finishers. It's probably salt. We haven't seasoned it yet remember. Salt or maybe soy sauce, good for colour too. A generous grind of black pepper too, especially in the beef gravy. But there are other seasonings: ground coriander with chicken or lamb? Worcestershire sauce? Take it easy, it's very distinctive. Mushroom ketchup? All good in a dribble. Sweetness is possibly needed. Don't be afraid of sugar. A pinch often makes all the difference. I often go for redcurrant jelly, it brings more gloss and mouthfeel too. Honey works with chicken (couple it with a scant teaspoon of mustard). But the 'something' you're missing is probably acidity. Chefs love this word, especially the Oliver boy, and for good reason. Acidity animates. It brings life. Maybe not a whole lemon but a quick zizz. This, in part, explains why I have at least twenty five different vinegars and if the house was on fire I would be saving my L'Olivier fruities first (sorry family). Fruit juices can also add acidity, I'm thinking mainly of apple with pork or chicken. It should be the not-from-concentrate variety or it will be too sweet and not nearly acidic enough. But know when to stop too. You are making an accompaniment remember, not a soup. Although... give my sons some bread and they'll make it so.